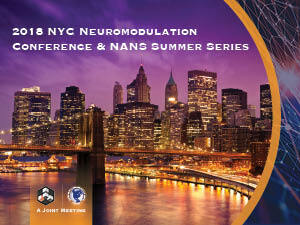 The joint NYC Neuromodulation and NANS Summer Series conference spans the continuum of healthcare technologies, from wearable technologies, to VR, to machine learning and how it’s integrated into all aspects of neuromodulation. On August 24–26, 2018, join thought leaders from medicine, academia, and industry for the most dynamic conference on the future of neuromodulation. Register for a preconference workshop or learn more about abstract submission below. Non-invasive and invasive technologies are moving rapidly from bench-side to bedside, even as renewed focus on mechanisms of actions (target engagement) drive basic and clinic research. New tools from the fields of artificial intelligence and machine learning, along with medical wearables and apps, are disrupting traditional models of clinical trials and treatment. Online registration has closed. To register for the 2018 Neuromodulation Conference & NANS Summer Series, please call the NANS Office at (847) 375-4714 or register onsite. Media credentials are reserved for working media from accredited or recognized organizations attending the meeting for the purpose of editorial coverage. Press credentials and waived registration costs are provided at the 2018 NYC Neuromodulation Conference & NANS Summer Series and do not indicate Neuromodec.com or NANS endorsement. Photography, video and audio recording by credentialed media may be limited based on conference attendee policy. Submit detailed credential requests to info@neuromodulation.org. All decisions on qualifications for media credentials are final. Credentialed media attendees must provide a valid photo ID on site at the meeting. The Abstract Submission Portal will close on Monday, April 16, 2018 at 1:00 pm CST. For answers to frequently asked abstract questions, please read our Abstract FAQ document. Abstract presentation dates are subject to change. Oral Presentations - Ten abstracts will be selected for oral presentations to take place during the Poster Highlight Sessions on Friday August 24, 2018 or Saturday, August 25, 2018. If accepted for an oral presentation, the Presenting Author will be required to present a paper poster and submit an electronic poster (e-poster) of their abstract. Paper Posters - All accepted abstracts will be required to present a printed paper poster. Presenting Authors will be assigned to present their work during one of the paper poster sessions on Saturday, August 25, 2018, or Sunday, August 26, 2018. Paper posters will be displayed for viewing on individually assigned poster boards. During the submission process, the abstract submitter may indicate whether or not they would like to be considered for an oral presentation. Please note: All accepted abstracts will be required to submit an electronic poster version of their abstract AND present a printed paper poster. There will not be a moderated session or physical presentations of e-posters. E-posters will be available on monitors throughout the entire meeting and uploaded to the meeting web page. All accepted abstracts will be published on the meeting website and have the option for publication in Brain Stimulation Journal (opt-in for publication during submission). Abstracts published in Brain Stimulation Journal will not include images, tables and figures. If you would like to have figures and tables published in Brain Stimulation Journal, all accepted abstracts will have the opportunity to submit a 2 Page Proceedings in its place. All accepted abstracts will have the opportunity to also submit a 2-page proceeding to be published electronically in Brain Stimulation Journal, following the meeting. Additional information on how to submit proceedings will be sent to Presenting Authors with abstract acceptance letters. NANS will provide a template to use for the 2 Page Proceedings for submission structure and format. The abstract, figures and tables must be included in the Proceedings and must not exceed 2 pages. All accepted Abstracts and 2 Page Proceedings are eligible for publication in the Brain Stimulation Journal which is the highest impact journal dedicated to neuromodulation. All publications are subject to secondary review by Brain Stimulation Journal editors. Abstracts and 2 Page Proceedings published in Brain Stimulation Journal may be subject to terms of the journal regulations. Abstracts submitted for the 2018 NYC Neuromodulation & NANS Summer Series Meeting are blindly reviewed by an independent scientific review committee and scored on scientific merit, originality, and the relevancy to the field of neuromodulation. Although scientific data is important, the quality of the abstract is the primary determinant for acceptance by the Conference Committee. The Conference Committee has final discretion regarding abstract presentation format. For any information on exhibits and sponsorship during this meeting, please view our 2018 exhibitor prospectus. We have different exhibit opportunities as well as sponsorship opportunities throughout the hotel. If you have any questions, please contact Chris Schroll at cschroll@neuromodulation.org.